A lot goes into the clothes we wear, covering a spectrum of activities including designing, manufacturing, logistics, marketing and sales. It’s no wonder that fashion and clothing manufacturing firms are applying AI technologies to transform various steps throughout the process. 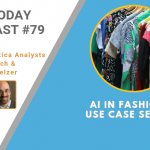 In this podcast, Cognilytica analysts Kathleen Walch and Ron Schmelzer will discuss various ways AI is being used in the fashion industry.